Mongolia Road Edition Wall map at 1:2,000,000 from Gizi Map, size 124 x 67cm (49" x 27" approx), with its road network presented on a base with relief shading showing the country’s physical geography. Names of larger towns and selected smaller locations, as well as of many topographic features are also shown in Cyrillic alphabet. The map provides a very fine presentation of the country’s geography through relief shading and graphics for salt flats, swamps, etc, plus numerous spot heights and plenty of names of mountain ranges and peaks. National parks and other protected areas are highlighted. 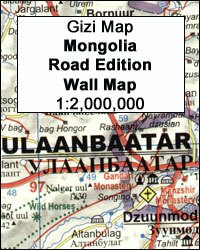 Road network indicates country tracks, gives distances on main routes, and shows locations of border crossings. Railway lines are included and domestic airports are marked. The map also shows boundaries of administrative provinces. Various places of interest are marked, including archaeological remains, natural curiosities, etc. Latitude and longitude lines are drawn at 1° intervals. Dual index, in both Latin and Cyrillic alphabet, is on the reverse. Map legend includes English. 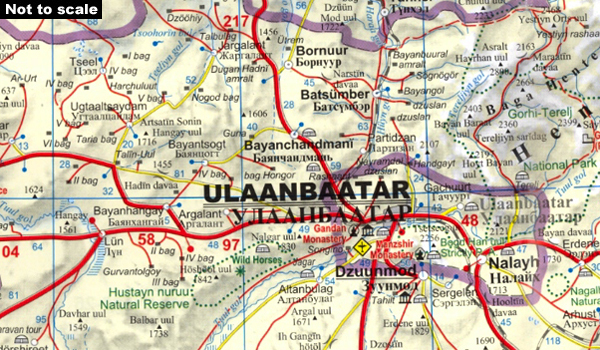 Current edition was published in 2008 and includes a street plan of Ullanbaatar, although less detailed than in the geographical version of this map, as below. 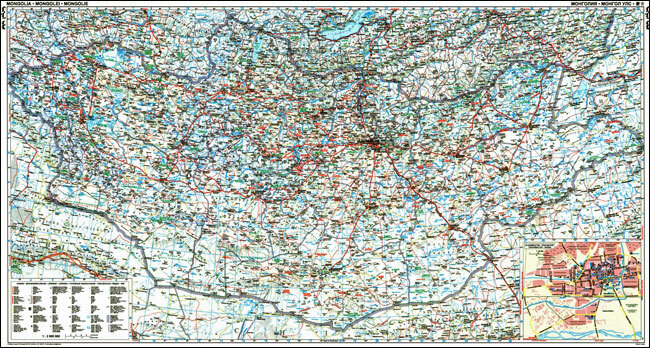 PLEASE NOTE: this map is also available in a geographical edition with bold altitude colouring and updated in 2012. Both versions are also published in a folded format. Size: 124 x 67cm / 49" x 27" approx.